When I first started quilting, 3.5 years ago, I set a goal of making a quilt for every branch of my family bush. I say bush, rather than family tree, because my family is a bit complicated. Especially on my dad's side. My dad has been remarried since 1986. With my stepmom, I also gained two bonus brothers and a sister. Dad and Carole gave me another sister in 1987. With this latest quilt, I have now made a quilt for each parent and sibling. Some of you may remember that my childhood home burned down in January 2014. With the help of generous quilters around the world, I made Rail Fence quilts for Dad, Carole, and my brother Jake, who was living there at the time. I chose the rail fence pattern because it was an easy block for anyone who wanted to participate. I chose red, green, and white because the fire happened just after Christmas, and my dad has a slight resemblance to a certain jolly ol' soul. 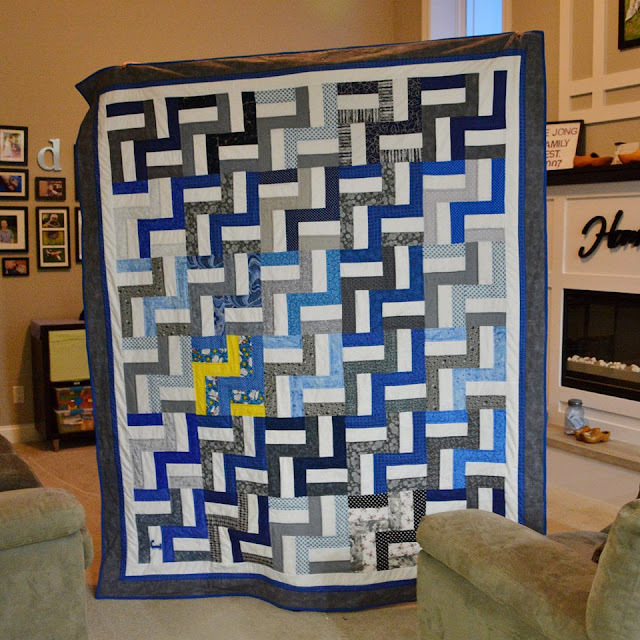 I still have to write about Jake's quilt because it took me quite a bit longer to finish his. My last post was a virtual trunk show to display my 2016 finishes. I will have to go back and do posts for 2013, 2014, and 2015, too! I did post about the quilt I made for my brother Chris and SIL Kelly. My brother grew up in Minnesota, and rightly cheers for the Vikings. My sister grew up in Wisconsin and we'll leave it at that. 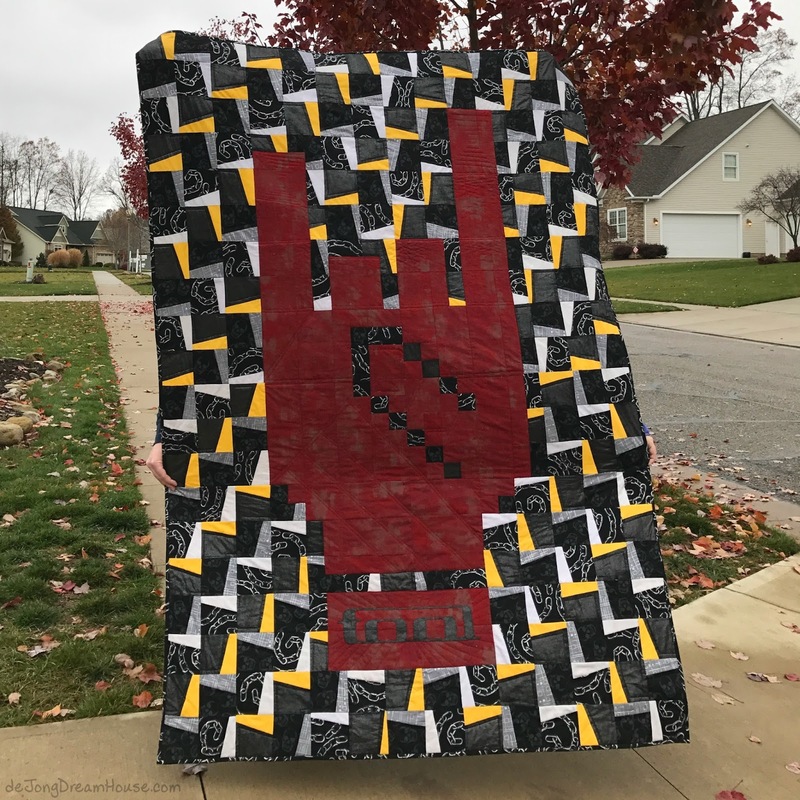 Here's a peek at quilt #27, Rivalry. 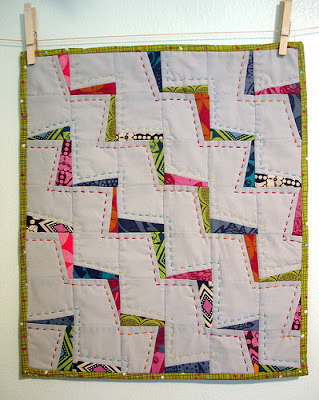 I made quilts for my sisters last year. And no, I haven't yet posted about either of those, either. 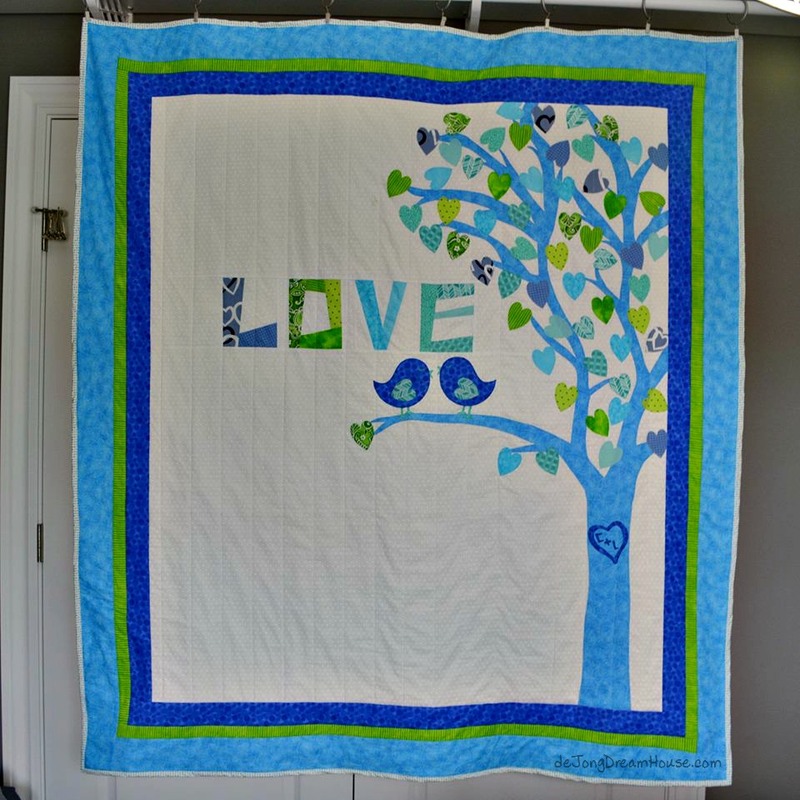 My 48th quilt was made for my youngest sister, Liz, and her husband, Chris, as a belated wedding gift. There last name is Burd, so I made them a Love Bird quilt. 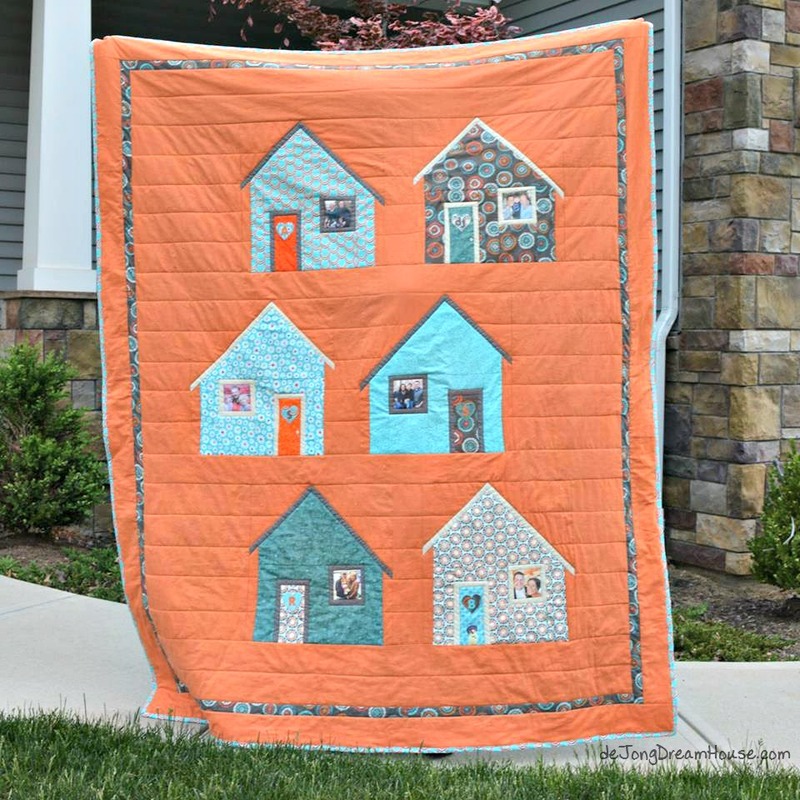 Quilt #47 went to my younger sister, Carisa, and her husband Andy, who build and retrofit accessible homes. Carisa's favorite color is orange, and each home has the initials and a photo of one of our siblings. All this left one quilt remaining. 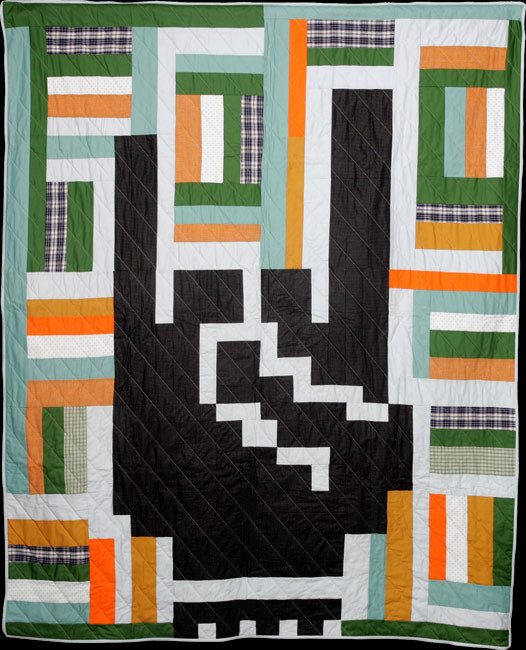 For the other quilts, I had an image pretty quickly of the kind of quilt I wanted to make. 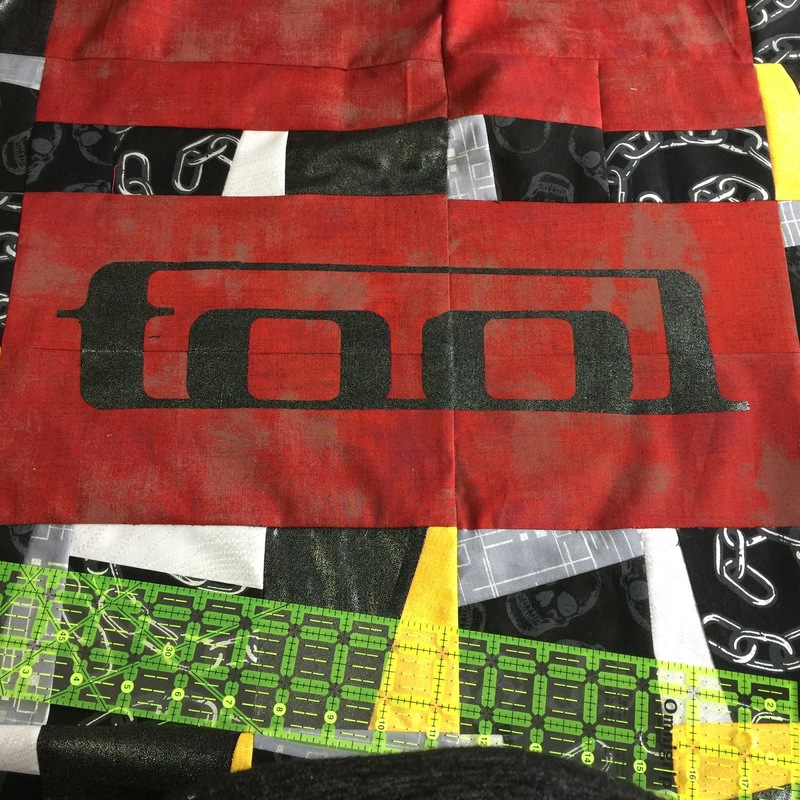 My brother John and his wife, Mary, are closest in age to me, but while I sit at home and sew, they get out and do fun things follow their favorite band, Tool. I didn't want to make anything that seemed too traditional or granny for them. I knew I would have to incorporate the band somehow, but it took me at least 14 sketched out iterations (and more yards of unused fabric than I'm willing to admit!) before I figured out exactly what I wanted to do. The final inspiration came from two different quilts. The first is from Boo Davis of Quiltsryche. 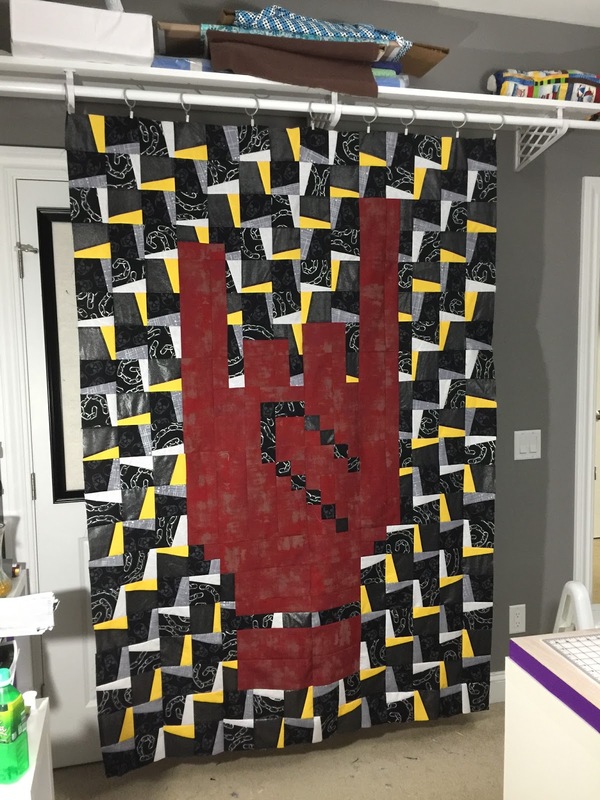 She has some awesome non-traditional quilts on her website, as well as a super cool pattern book that I may or not have ordered for myself as a Christmas gift. I loved the hand, but wanted to do something a little different with the background. I was stuck on the idea of thunderbolts, which made Jenn of All Trades' Lightening Zig Zags jump out at me when I found it. It took a couple of tries on my new toy, Electric Quilt 7, to figure out the parts where the blocks were not either a solid red or a full zig zag. Then it was finally time to get going! 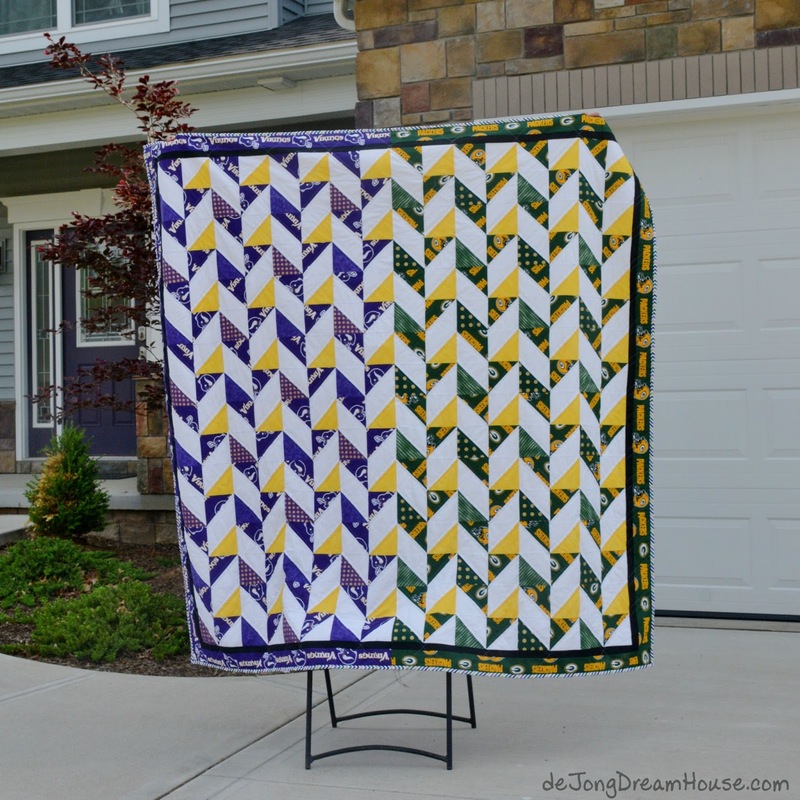 I made more than my usually share of dumb mistakes on this quilt, which I am going to attribute to the fact that I sustained a new concussion to my collection a few weeks ago. The most expensive mistake I made is that I forgot that the slashes of my zigzags go one way for 2 sections of the quilt and the other way for the other sections. So I had time to work on my next quilt top while I chased down more fabric, some of which was now out of print. Yikes! Once I had my fabric and blocks in order, I was able to start working on some of the odd blocks. This was a quilt that kept me second guessing myself a lot. Up close, I wondered if it would be too loud. I was so relieved to get to this point. 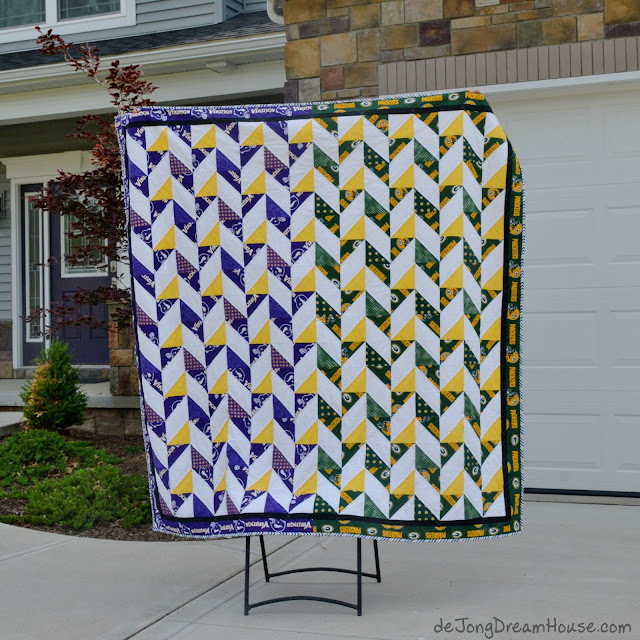 I think I made the whole quilt three times with all the times I changed my mind about how I wanted the zigzags to go, plus all the times I apparently couldn't read my own pattern! I made a few changes from Boo's design, with the thumb, size of the ring and middle fingers, and the wrist. The reason I changed the wrist is so that it would be big enough for an appliqued band logo. 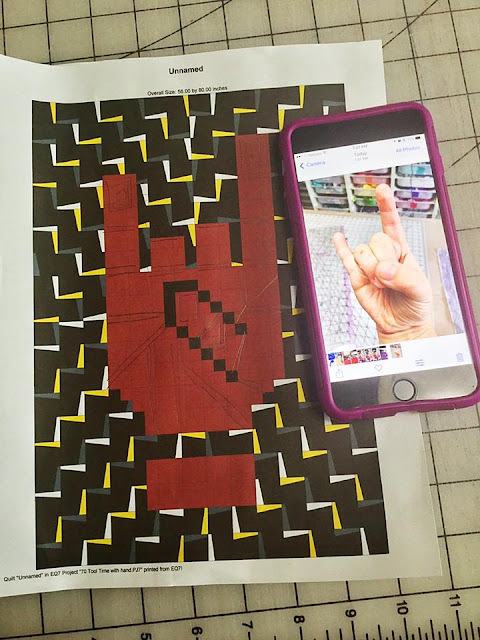 I modeled the quilting of the hand after the lines on my own hand. I added "fingerprints" to the tips of the pointer and pinky fingers. The quilting is a bit hard to see, but I echoed the zig zags for the non-hand sections. I've started adding the Instagram tag and website on my quilts so recipients can come back here and read about their quilt. My sister Carisa was here with her family to celebrate Thanksgiving with us. We loved having them here, and we love that she will be able to hand deliver this quilt to John and Mary. 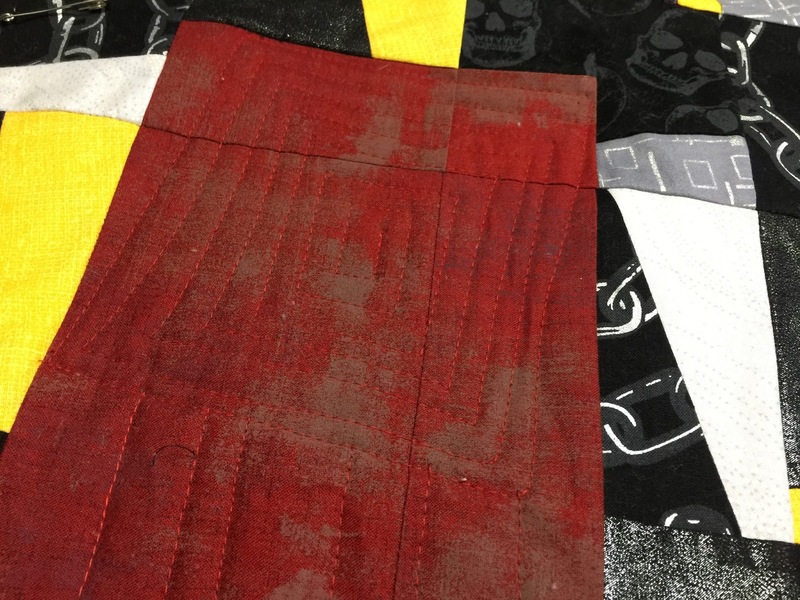 To see more pictures of this quilt in progress, look for #tooltatquilt on Instagram. If you'd like to see what I'm currently working on, follow me at de Jong Dream House.